We believe that the gospel is not simply the entry ramp onto the highway of Christianity, to be abandoned for bigger and better things once we’re converted. The gospel not only saves us into God’s family. The gospel also strengthens us as God’s family. The propensity of the human heart is to wander from the gospel. Because our hearts are fickle, we need to be reminded of the gospel often. Moment by moment. Like our next breath of air. What if you could go about your life so confident in God, so caught up in the wonder of what it means to be a son or daughter of the King, so saturated in the glorious truth of who He is for you, what He’s done for you, and what He promises to do for you... that the things that cause your heart to wander begin to lose their power, that the clawing after approval, control, power, and comfort begins to lose its significance, that the struggles with guilt and fear and shame begin to lose their crippling effect on your heart? How does that happen? By breathing the air of the gospel in the midst of the everyday rhythms of life. That’s what we’re after as a church. We want everyone who connects with this church family to experience the transforming power of the gospel in their lives. In response to the gospel, we will be a people who sing of the grace, goodness and glory of God. In response to the gospel, we will live in such a way that we connect the story of people's lives to the ultimate story of the gospel. In response to the gospel, we will live within the context of deep, authentic relationships. In response to the gospel, we will leverage our time, talent and treasure to further the mission of God for the glory of God. As a church, we work really hard to not busy up people's lives with lots of programs. Instead, our hope is to move people toward three strategic environments. 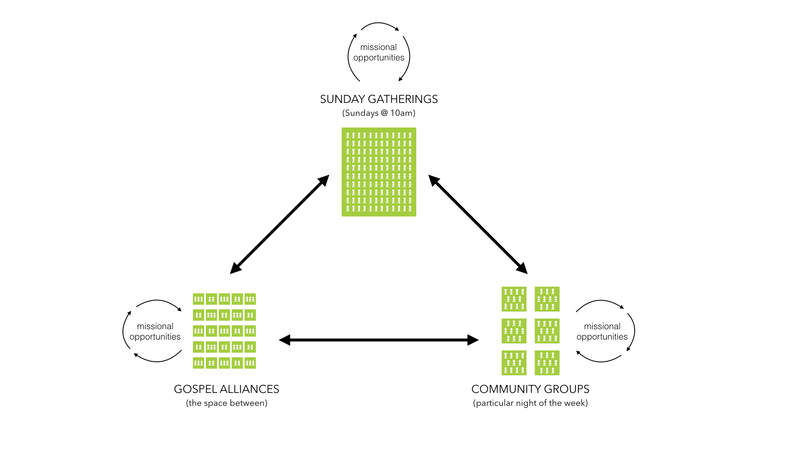 All three of the environments represented in our strategy for gospel transformation (Sunday Gatherings, Community Groups, and Gospel Alliances) play a significant role in conforming us in Christlikeness. The goal is for us to flourish in each and every one of these environments, believing that all three work together to create a more integrated experience of gospel transformation. This is just another name for a church service. 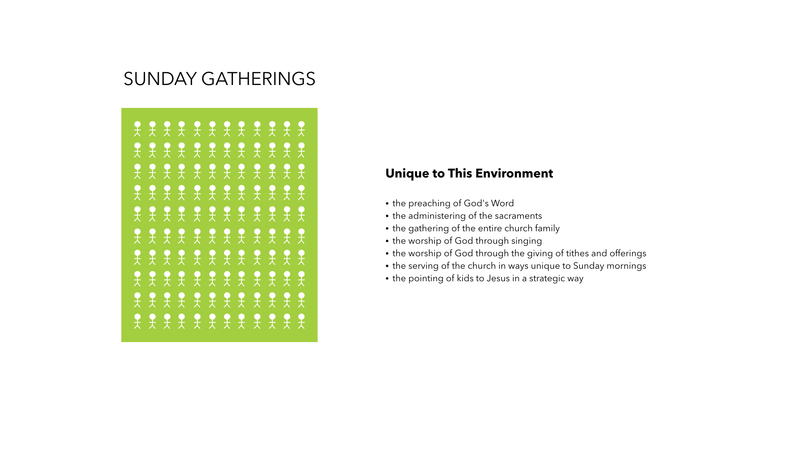 Simply put, we’re talking about the weekly gathering of God’s people (along with some of our curious non-Christian neighbors, co-workers, family members, and friends) to worship God as one big family. Community Groups are smaller bands (usually anywhere between 8-14 people within our congregation) of diverse, imperfect people who gather weekly throughout the city and the surrounding area to wrestle with the implications of the gospel in every sphere of life. 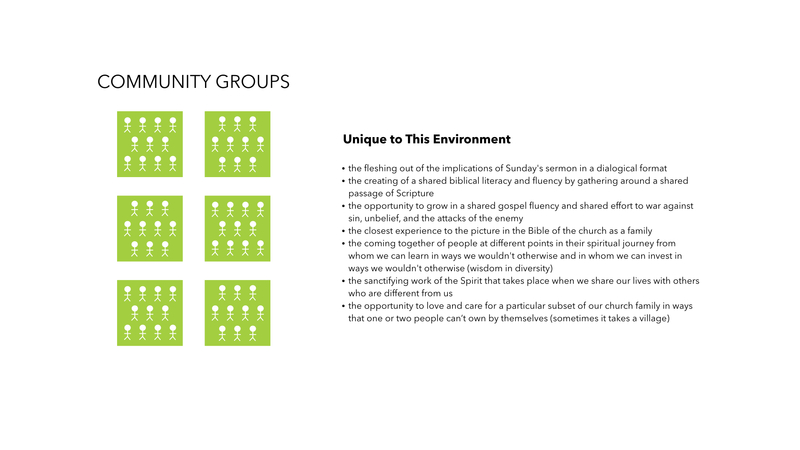 Community Groups are sermon-based groups designed to facilitate gospel transformation in our lives, by the power of the Holy Spirit, as we establish a culture of relational authenticity and transparency rooted in God’s Word. Where does the outreach of the church come into play? 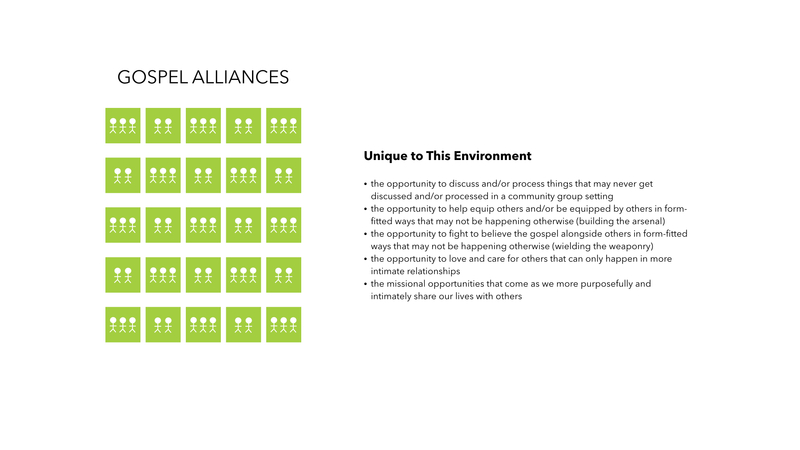 If you consider our strategy you’ll see that we believe that all three of these environments represented present us with opportunities to point people to Jesus. Each and every relationship with each and every person who doesn’t yet follow Jesus is unique. For some of us, the best thing we could do is to invite a non-Christian friend to a Sunday Gathering. For others of us, that’s perhaps the worst thing we could do. Some people will be compelled to explore the gospel, not by gathering with the church at large, but by sitting in a living room with a small group of people wrestling with the implications of the gospel in everyday life (i.e. Community Group). Still others will be compelled to explore the gospel by hanging out with you and a brother or sister in Christ who you’ve come alongside to more intentionally fight the good fight of faith (i.e. Gospel Alliance). As we leave and re-enter each of these environments, we must be strategic in determining the best way(s) to point our non-Christian friends to Jesus. There’s no one-size-fits-all approach. The gospel never changes, but our missional strategy is ever-changing.